McDonald’s announced today that it’s making a greater effort at offering transparency and engagement to the public, in a new campaign it’s calling “Our Food, Your Questions.” McDonald’s has a serious image problem and a sagging bottom line, which might explain its sudden willingness to fling the barn door open as a way to shed its reputation for serving mass-produced, unhealthy food. Showing the public how the sausage is made may win favor with some consumers, but a better strategy for the fast food giant would be to make truly meaningful commitments to sustainability. McDonald’s realizes people have big questions about the quality and origins of their food. So the company that serves 28 million people daily in the U.S. is now promising straightforward answers. McDonald’s is releasing behind-the scenes web vignettes and infographics, which will apparently illustrate the production process behind its products like Chicken McNuggets and the McRib, and how they go from “farm to restaurant.” It also says it will listen to real customers’ questions online and answer honestly in real time. McDonald’s has also enlisted professional skeptic and former “MythBusters” co-host Grant Imahara, who is featured in a series of webisode videos addressing consumers’ persistent doubts and questions. “We know some people–both McDonald’s fans and skeptics–continue to have questions about our food from the standpoint of the ingredients or how food is prepared at the restaurant. This is our move to ensure we engage people in a two-way dialogue about our food and answer the questions and address their comments,” Kevin Newell, EVP-chief brand and strategy officer for McDonald’s USA, told BurgerBusiness.com. Until now, what happens behind the curtain at McDonald’s has been invisible to most of us. But because the company’s supply chain is so long, and it sources raw ingredients from such a wide array of locations and facilities, it would be impossible for any one tour, vignette, or infographic to show more than a sliver of what goes on at the farm, factory, and processing levels. And while it’s angling for the farm-to-table crowd, as the world’s largest buyer of beef and pork with hamburgers for as low as one dollar, McDonald’s current practices will probably still be considered factory-farm-to-table. And while it says it no longer uses “pink slime” in its burgers, it does use an anti-foaming agent, dimethylpolysiloxane, in the oil it uses to cook Chicken McNuggets. It also cops to using azodicarbonamide, AKA “the yoga mat ingredient,” in its buns and sandwiches, saying it has many uses: “Think of salt: the salt you use in your food at home is a variation of the salt you may use to de-ice your sidewalk.” As for why its U.S. menu contains items that are banned in Europe? “Every country has different food safety and regulatory standards and, because of this, ingredients will vary in our restaurants around the world. But no matter where you’re dining with us—in the U.S. or abroad—you can be assured of the quality and safety of our food.” Not really an answer most are looking for. 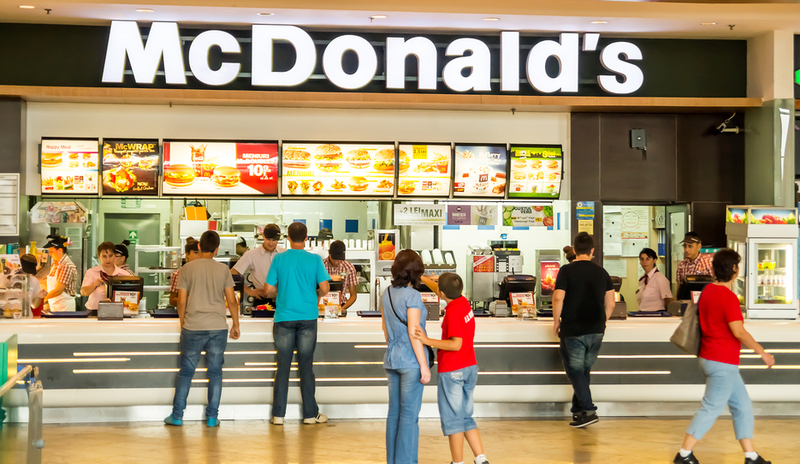 Most people simply don’t think of McDonald’s as a healthy place to eat, despite its efforts to offer more menu choices. Its insidious marketing of fast foods to kids hasn’t won it any points either. With U.S. sales down, recent food safety scandals in China, and labor issues here, its rivals are eating McDonald’s for lunch and breakfast, too. The truth is, McDonald’s is facing a marketplace where people no longer want fast food, but good food served fast. Millennials are now driving the food bus and they’re heading straight to Chipotle and other establishments that are offering healthier options, including foods without genetically engineered or artificial ingredients and meat from animals raised without antibiotics. An estimated 80 percent of all antibiotics sold in the U.S. are being fed to animals on factory farms for purposes other than treating diseases. McDonald’s producers uses antibiotics to “treat, prevent, and control disease” in its food-producing animals. Using antibiotics to prevent disease and promote faster growth (the company says it has phased out the latter since 2003, though it still allows them for cattle and swine, and some say using them to prevent disease has the same effect)—rather than merely to treat infections—allows producers to raise many animals together in dirty, crowded spaces. And it has led to the widespread overuse of antibiotic-resistance, what the World Health Organization and the Centers for Disease Control now widely regard as an international epidemic. From food safety scandals to the serious public health impacts of eating fast food, consumers increasingly want truth, trust, and transparency in their food. But transparency demands responsibility and is toothless on its own. Today’s eaters want to see where their food comes from so they can make informed choices and also advocate for change. McDonald’s is racing to play “ketch-up” in the transparency games, but it’s unclear whether any real change will come of its efforts. If the company really wants to connect with consumers, it should take a hard look at the practices behind the ingredients it uses and begin to change them incrementally. It could take a real stand for sustainability—including changing to suppliers and producers who raise meat without antibiotics. As the biggest fast food company in the nation, McDonald’s choices are no small potatoes. A change like that could mean a much happier meal. A fine piece that we MUST learn from. The entire US meat industry is designed for fast food. McDonalds has nowhere else to buy meat in the quantities they would need it. The entire industry must be rebuilt--from the ground up. The basic tangent of this issue is the correlation between content and value, which drives every food enterprise. Thanks to Naomi for covering the issue so broadly and so well. The 18 month rebranding campaign that McDonald's launched last summer - AdWeek called it the "McSoulSearch" - seems pretty superficial thus far. Starkman's point that "people no longer want fast food, but good food served fast" is huge - the company just doesn't seem to have learned it yet. Will the existential angst of this iconic corporate behemoth yield substantial change? I'm hoping all the external pressures on the company (add its use as a symbolic weapon in the East/West hostilities over Ukraine to that list) plus its extraordinary visibility render it uniquely influenceable in the long run.